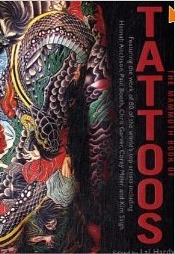 Features 500 photographic images of tattoos, covering various styles from bold 'tribal' pieces, Chinese characters and hieroglyphs to delicate air-brushed designs, and from all-over 'body suits' to individual motifs - works as distinctive as the bodies they adorn. More and more people are getting into body art, but how do you go about choosing a design? It is, after all, a lifetime decision that's going to cost thousands of dollars to erase or alter? Organized by theme, this title features line drawings that cover every conceivable subject area, from historical and traditional to modern. 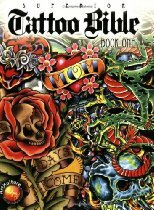 While most tattoo books available today concentrate on one specific genre, this book covers many different genres and the ideas are endless. This is not just a book to add to your collection - this is your collection. 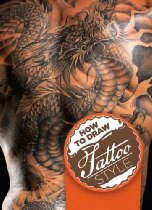 How to draw tattoos.The book is rather compact, but the range of information it contains is impressive- it includes sections on the history of tattoos, types of tattoos, as well as step-by-step examples. 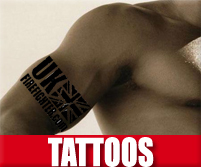 Men and women wear tattoos to reflect their individuality. These tribal tattoos are bold statements that are rooted in historic and cultural sources. This book features black work patterns that incorporate large solid areas with fine line accents, and motif ideas including totems and talismans. Straight from the experts at Bizarre, the planet's No. 1 alternative lifestyle magazine, this astonishing magbook is a celebration of incredible ink from around the Globe. 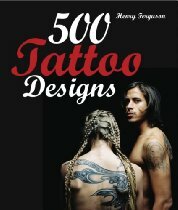 Containing interviews with cutting edge tattoo artists, body art fanatics, expert advice and much more, this publication reveals everything you need to know about the burgeoning body art scene.